SAN FRANCISCO (KGO) -- A pair of Bay Area lawmakers took a stroll across the Golden Gate Bridge Friday to send a signal to Governor Jerry Brown. 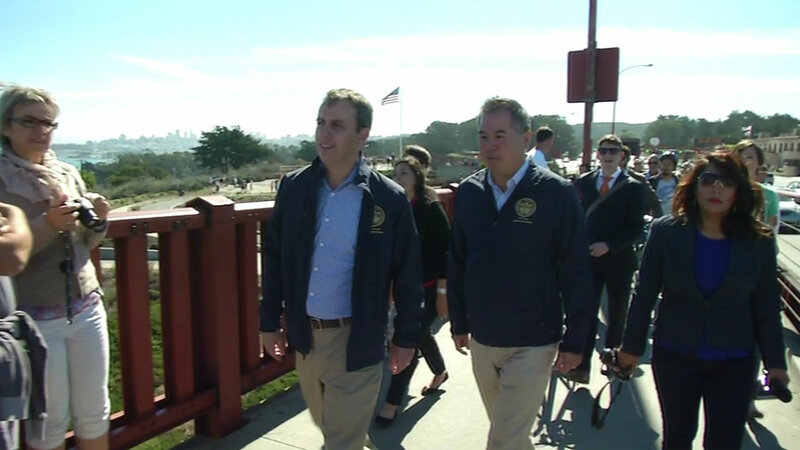 Assemblymembers Phil Ting and Marc Levine walked across the famous span. They authored a bill that would prohibit charging a toll on cyclists and walkers on the Golden Gate Bridge and state-owned bridges. They say charging a toll would send the wrong signal to people getting some exercise. "With California leading the way on climate change and reducing greenhouse gases, the folks that are walking and biking, we want to incentivize that, not discourage that," Ting said. Charging a sidewalk toll is just one of 45 ideas considered by the Golden Gate Bridge District to eliminate a $33 million deficit. The governor has until October 11 to sign or veto the bill.